I made an incredible vegan, gf, lasagna that my family found incredible and then I told them it was vegan. Make your own tomato sauce for pasta or use one of our ready to use pasta sauces. I used Sahara brand. Easy, peasy. Into the tomato sauce, I put both packets of Big Mountain Veggie Crumble (one box) in and let it simmer for a good couple of hours, covered. Stir periodically and add in water if it gets too thick to prevent burning.Season accordingly if you prefer a more flavorful sauce. Basil, oregano, Italian seasoning, garlic, etc. 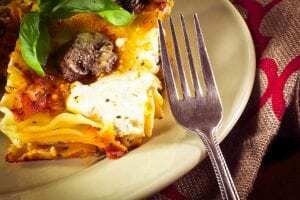 Grab a lasagna dish or an oblong baking dish big enough to hold the ingredients. I use Rizopia GF lasagna noodles. Oven ready means no boiling needed. Make sure your sauce is not thick as the noodles need moisture to soften them and that comes from the sauce. First layer is a thin layer of “meat” sauce. Next is noodles. Layer the next levels as sauce,noodles, etc and finish with sauce. Cover with Foil and bake in a 350F oven for 30 minutes. Take a jar of Nona’s vegan Alfredo or Carbonara and heat it in a saucepan. Remove the lasagna from the oven and spread the Nona’s sauce over the top of the lasagna. Return the lasagna to the oven for another 30 minutes to finish. Sprinkle Earth Island Grated Parmesan on top of the lasagna to your liking. Turn the oven to broil, return lasagna to the oven and broil top for 5 -10 minutes watching that it browns and does not burn. Remove from oven and let it sit for 10 minutes to cool and firm up to cut. Serve with dried chili’s, extra tomato sauce, oregano or basil. Let guests or family sprinkle more Earth Island Parmesan.